The big advantage China has over Japan when it comes to Africa is its lack of democracy. That struck home while observing Japanese Prime Minister Shinzo Abe’s Africa tour over the past week – the first by a Japanese prime minister in nearly a decade. Comparisons have inevitably been drawn with China which has been all over the continent for at least a decade and a half, leading the international scramble for resources.China is now Africa’s top trading partner, snaring about 13.5 % of the continent’s commerce, with Japan lagging far behind with only 2.7 % or so. Abe has become more assertive and competitive with China closer to home, most notably in the increasingly belligerent stand-off over their competing claims to the Senkaku-Diaoyu islands.And it would be hard not to see his Africa safari as part of his wider purpose of re-asserting Japan on the international stage, after its long slumber in the economic doldrums. 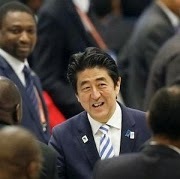 Japanese officials, however, played down the comparison with China, suggesting that Japan’s interest in Africa is not so much natural resources, as developing human resources and business skills.But they could not help acknowledging that Abe’s visit to Mozambique, for example, was mostly about helping Japanese companies, which are already quite present, get more of the booming gas and coal business. It is not as if Japan has just discovered the African continent. It did so formally as early as 1993 when it launched its Tokyo International Conference on African Development (TICAD) process of formally consulting African leaders about their development needs. There have been five TICAD summits since then and scores of African leaders have visited Japan for them. Yet Abe was the first Japanese prime minister to visit the continent since Junichiro Koizumi went to Ghana and Ethiopia in 2006.The reason, essentially, officials admit, is the ephemeral character of Japanese prime ministers. Since TICAD was launched in 1993, there have been 14 prime ministers (counting Abe twice, since he was first in office in 2006-2007).So the average lifespan of a prime minister in that period was 18 months. Most have been too preoccupied with survival to concern themselves with Africa. Koizumi managed an unusual five years in office so he had time to visit Africa. Abe has barely clocked up one year in office but he is riding high in the polls because of his popular stimulatory ‘Abenomics’ and his hawkish assertiveness with Pacific neighbours over disputed islands. So he felt confident enough at home to take a week off in Africa.During the same span of those 14 Japanese prime ministers there have been just three Chinese presidents, giving each of them plenty of time and of course absolute political certainty, to travel in Africa and to consolidate relations. Abe tried to cover as many bases as possible during his first Africa adventure; the Cote d’Ivoire stop served also as a gateway to West Africa and Francophone Africa, Mozambique represented Southern Africa and Lusophone Africa and Ethiopia East Africa as well as the AU of course. One of Abe’s missions was also frankly to ask African leaders ‘to improve the business environment and ensure the safety of Japanese companies,’ one official said, explaining that this objective had been inspired mainly by the attack by al-Qaeda-linked terrorists on an Algerian oil refinery last year in which about 12 Japanese nationals were killed.And so peace and security were an important focus of the trip. In Addis he also pledged US$320 million to relieve the effects of conflict and natural disasters, including US$3 million for peacekeeping in the Central African Republic and US$25 million for South Sudan – where Japan has about 400 of its ‘Self Defence Forces’ in the UN peacekeeping mission. Abe claimed that Japanese corporations had already helped transform and stabilise Southeast Asia, a major field of Japanese investment, in this way. ‘There is no doubt in my mind that the next ones to experience this, with Japanesecompanies as the catalyst, will be the countries and the people of Africa.’How this ambitious, yet rather abstract and Zen-like discourse went down in Addis Ababa is hard to say. His audience comprising mainly African government officials were probably mainly totting up the US$s in aid pledges instead. Yet if only kaizen culture would flourish on the continent!But perhaps even more beneficial for Africa would be if the great Japanese tradition of turfing out leaders after an average of 18 months in office took root here.